Heralded as “impossible to put down” (Elle), and named a Best Book of the Summer by Glamour, Good Housekeeping, Cosmopolitan, Elle, Marie Claire, and Us Weekly, Eight Hundred Grapes is a heartbreaking, funny, and deeply evocative novel about love, marriage, family, wine, and the treacherous terrain in which they all intersect. There are secrets you share, and secrets you hide… What if your beloved fiancé, he of the crinkly smile and irresistible British accent, had kept a life-changing secret from you? And what if, just a week before your dream wedding, you discovered it? Eight Hundred Grapes is a story about the messy realities of family, the strength (and weaknesses) of romantic love, and the importance of finding a place to call home. “This winning tale will both satisfy on a literary level and encourage oenophiles to pour themselves a glass of a recent vintage to enjoy while reading; it’s a tasty treat for wine lovers and teetotalers alike” (Publishers Weekly). You won’t be able to put this “addictive” (Us Weekly) novel down. My father has this great story about the day he met my mother, a story he never gets sick of telling. It was a snowy December morning and he was hurrying into his co-worker’s yellow Volkswagen bug parked in front of Lincoln Center, holding two cups of coffee and a massive slew of newspapers. (His first wine, Block 14—the only wine in his very first vintage—had gotten a small mention in the Wall Street Journal.) And between the excitement of the article and the steaming coffee, Daniel Bradley Ford didn’t notice that there were two yellow bugs parked in front of Lincoln Center. That his East Coast distributor was not the one huddling for warmth in the yellow bug’s driver’s seat. But, instead, his future wife, Jenny. He had gotten into the wrong car to find the most gorgeous woman he’d ever seen, wearing blue mittens and a matching beret. Her long, blond curls seeping out from beneath. Her cello taking up the whole backseat. Then she reached out her hand for the cup of coffee he was ready to give her. Synchronization, my father would say. This was a very big word for him. Synchronization: The coordination of events to operate in union. A conductor managing to keep his orchestra in time. The impossible meeting of light reflection and time exposure that leads to a perfect photograph. Two yellow bugs parked in front of Lincoln Center at the same time, the love of your life in one of them. Not fate, my father would add. Don’t confuse it with fate. Fate suggests no agency. Synchronization is all about agency. It involves all systems running in a state where different parts of the system are almost, if not precisely, ready. For my father, it was the basis of how he approached his work: first as a scientist, then as a winemaker. He was one of the first biodynamic winemakers in America, certainly in his little corner of it. He considered not just the grapes themselves, but—as he liked to espouse—the ecological, social, and economic systems that needed to be synchronized in order to properly grow them. My father said that doing it any other way was lazy. As for me, I had trouble seeing the role synchronization played in my own life. The role it was supposed to play. Until it went and destroyed my blessedly ignorant, willfully optimistic life, in a way I couldn’t ignore unless I ran from it. So, on that fateful Friday, I did just that. I ran from it. With only the clothes on my back and a hastily packed suitcase, I drove from sunny Southern California—the place that had been my home for the last fourteen years—to the small town in Northern California on the edge of the Russian River Valley. The place that’d been my home for my entire life until then. Nine hours, five rest-spot stops, two terrible milkshakey coffee drinks (one vanilla, one strawberry), and a roll of Rolos later, I arrived in Sonoma County. I should have felt relief, but as I passed the familiar sign for Sebastopol—its wiry hills visible behind it—I caught a glimpse of myself in the rearview. My hair was falling out of its bun, my eyes were deeply unsettled, and I couldn’t escape the feeling that I was about to walk into a new kind of hell. But it was getting late, and I hadn’t eaten (save the Rolos), and the rain was coming down hard, and I was so tired I couldn’t think. So I pulled off Highway 12, getting off at the exit for downtown Santa Rosa, knowing where I was going before I admitted it to myself. The Brothers’ Tavern was something of a Sonoma County institution. The original owners—and brothers—had opened the doors seventy-­eight years ago with the idea that it would be the place in the county that was open late, and the place that served the best beer. The subsequent owners had stuck with the plan, taking the bar and grill to another level, brewing award-winning beer on site that drew people from all over the state. Of course, the current owners of The Brothers’ Tavern were my brothers. Finn and Bobby Ford. And the jig would be up as soon as they saw me. They would see it on my face. What I had been through. But when I walked into the bar, Finn was the only one standing there. No Bobby. Bobby was always there on the weekends, so this was the first confusing thing. The fact that my father wasn’t sitting on the corner bar stool having a drink with them was the second. My father came by every Friday—the only way to start his weekend, he liked to say, was to have a drink with his boys. My heart dropped in disappointment, realizing that this was really why I had shown up, despite the ramifications. So that my father would have a drink with his girl, jig up or not. But it was only Finn standing behind the bar, looking at me like he didn’t recognize me. And, for a minute, I wondered if he didn’t. My hair was in a disheveled bun, my smile fake and forced. And it was late. Maybe I looked like another straggler, trying to get a drink before he closed down for the night. To his credit, Finn didn’t call me out on any of this. He walked past the other customers, who stared at me as I took a seat at the end of the bar—the one close to the fireplace. My father’s seat. I sat down, ignoring their pseudo-casual glances, Finn drilling them with looks so they’d stop staring. This was Finn, the perpetual big brother. He was ready to protect me even before he knew what he was protecting me from. “A nine-hour drive?” he said. “No, Finn,” I said, knowing Finn thought I was an awful driver. Like running-out-of-gas-while-getting-a-speeding-ticket awful. It’s hard to lose that reputation. Even if it only happened once. “Glad to hear that, at least,” Finn said, sincerely. Then he nodded, trying to decide how hard to push, keeping his eyes on me. Finn was my good brother. They both were pretty good, but Finn was the truly good one in my book, even if he wasn’t the good one in anyone else’s. Bobby was more ostensibly impressive: The captain of the high school football team, a local legend, a successful venture capitalist with a full life in San Francisco. A beautiful town house, beautiful cars, beautiful family. He was five minutes younger than Finn, but in every other way he seemed to always come in first. Bobby had bought the bar as a hobby and to give Finn something to do. Finn believed less in employment. He owned the bar so he could drink for free and so he could keep taking photographs. Finn was a great photographer, but he seemed to only work—weddings, family portraits—when the mood struck him. He was a little like my father in that way, adhering to a code of purity that only he understood. I shook my head, keeping my eyes down, afraid to meet Finn’s eyes. Finn looked so much like my father. Both of them had these dark eyes, with matching piles of dark hair. They were handsome guys, all American. The only obvious difference was that Finn liked to keep that mane of hair under a backward baseball cap. Usually a Chargers cap. It made it hard to tell him what was going on without feeling like I was about to disappoint my father too. The harvest of the grapes—the most important five weeks in my father’s year. I’d arrived home under duress the very weekend he always held most sacred—the last weekend of the harvest. Every year I came home for it. We all did. We returned to the family house: The brothers slept in their old rooms, I slept in mine. Our various spouses and partners and children filled up the rest of the house. And all of us joined my father to harvest the final vines, to drink the first sips of wine. We all stayed for the harvest party. But this year was supposed to be different. For a variety of reasons, I wasn’t supposed to be there. Finn, realizing his error in raising this, shifted from foot to foot. “What do you want to drink?” he said. I pointed at the entire bar behind him. The bourbon and scotch and whisky were like Christmas presents. I sipped at the bourbon. Then I turned, almost immediately, to the wine. Finn put the bottle on the table so I could see what he had poured. It was a dark and grippy Pinot Noir. The Last Straw Vineyard. B-Minor 2003 Vintage. One of the wines from our father’s vineyard. My favorite wine from our father’s vineyard, mine and Bobby’s. One thing we had in common. Finn nodded, tightly. Like there was something he didn’t want to say, not out loud. Then, just as quickly, he softened. Finn leaned against the countertop. “Not for you,” he said. It was the nicest thing he could have said, and I gave him a smile so he knew how much I appreciated it. Then he walked back toward the kitchen, taking a sip from the bourbon as he went. I sat taller on the bar stool, more aware of the looks I was getting, now that Finn was moving away. Finn turned back for just a second. “Hey, Georgia . . .” he said. “You know that you’re still wearing your wedding dress, yes?” he said. I looked down at the sprawling lace, dirty from the five-hundred-mile drive and the run across The Brothers’ Tavern parking lot. And what looked, sadly, like a lost Rolo. I touched the soft skirt. “I do,” I said. 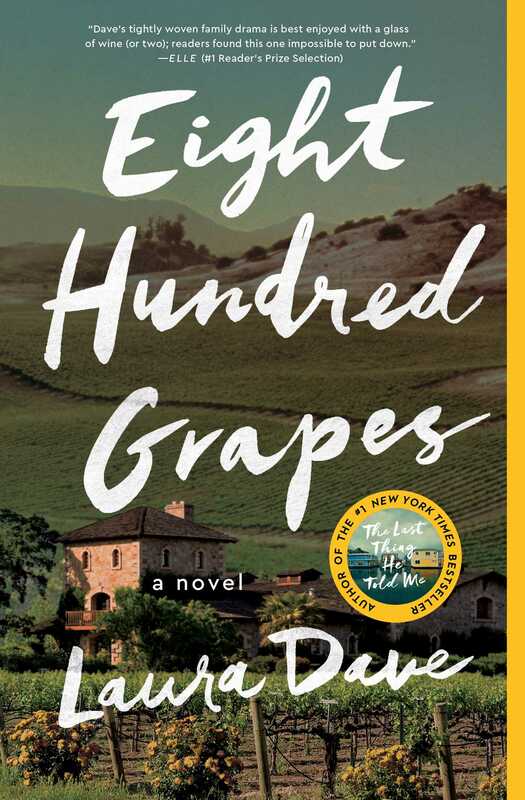 This reading group guide for Eight Hundred Grapes includes an introduction, discussion questions, ideas for enhancing your book club, and a Q&A with author Laura Dave. The suggested questions are intended to help your reading group find new and interesting angles and topics for your discussion. We hope that these ideas will enrich your conversation and increase your enjoyment of the book. In law school, Georgia Ford made her twin brothers sign a pact to never take over their family’s vineyard. There was no way she was going to get stuck in the tiny Californian town she had known all her life. Years later, Georgia’s life seems to be on track. 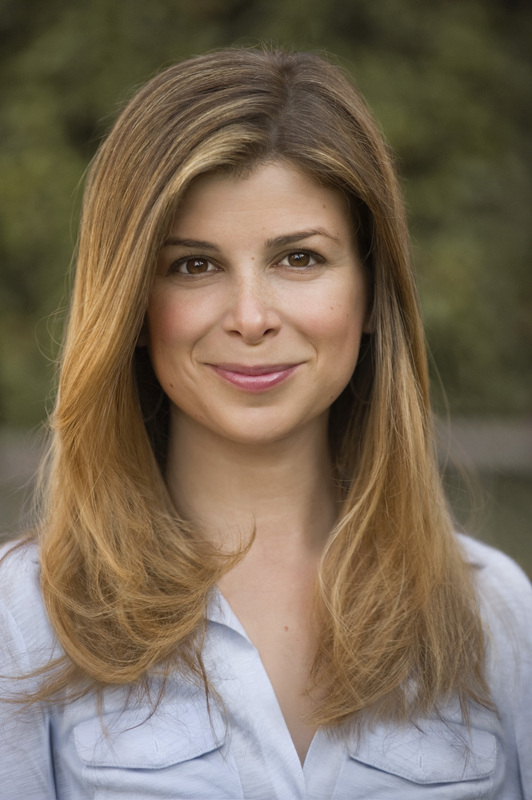 She’s a successful lawyer engaged to a handsome British man who is ready to whisk her away to a chic new life in London. But just a week before her dream wedding, Georgia discovers that her supposedly perfect fiancé has been hiding a life-changing secret: a four-year-old daughter that he unwittingly conceived with a beautiful movie star. Devastated, she flees north to the one place she was determined never to use as a safety net. Upon her return home, however, Georgia realizes that her fiancé is not the only one with secrets. The family business is crumbling, and it’s up to her to save the vineyard from its last harvest. Eight Hundred Grapes is an astonishing portrait of an American family seeking solace where they least expect it, and their desperate attempt to find solid ground. 1. Discuss the myth of the yellow VW bug and the Ford family’s belief in “synchronization” as opposed to fate. How does this theory evolve over the course of the novel? 2. Do you think Georgia feels she has agency in the beginning of the story? The end? Is she right? 3. Georgia has made a lot of life choices to avoid repeating an upbringing that involved unpredictability. How does your life resist or yield to your own childhood? Discuss how that relates to the definition of “concerto” and its varying degrees of cooperation and opposition. 4. As twins, Finn and Bobby are often at odds with each other. In what ways do you think they are alike? Why do you think it’s so difficult for them to connect? 5. The one common denominator for the Ford siblings is love of their mother’s lasagna. Do you have a similar tradition in your family? What brings you together, no matter what? 6. Discuss the role of the contract that Georgia asks her brothers to sign. Why is she so afraid of the vineyard? Can you relate? 7. How does forgiveness play into this story? Could you forgive Ben for hiding Maddie? Could you forgive Finn for kissing Margaret? 8. Georgia insists on doing everything in her power to stop her loved ones from doing something they’ll regret. Discuss her mother’s response, “But which way is regret?” What do you think she means here? 9. Why is Jacob unexpectedly appealing to Georgia? Discuss their similarities, both in personality and life paths. 10. Georgia’s father has many rules of winemaking, like: “If you do your job,” then, “you make good soil.” He also has “a theory that what was equally as important as the wine you presented in your vintage was the wine you left out of the vintage. In winemaking, this was known as declassification.” How do these rules apply to decision making on a larger scale? Do you think Georgia abides by them? 11. Who are Georgia’s “have-to-haves” at the end of the novel? Who are the have-to-haves in your own life? 12. Ben takes full responsibility for lying, but Finn points out that Georgia wasn’t necessarily tuned in to her fiancé. Discuss whether there are two sides to every conflict, even when something seems black and white. 13. Do you think that Georgia will be happy running the vineyard and being with Jacob? Why or why not? What’s the biggest lesson she has learned? 1. This is the perfect excuse to make a wine tasting part of your book club! Research local vineyards and be adventurous about trying vintages outside your comfort zone. 2. According to the Ford family, both music and wine rely on synchronization. Patronize a concert together, whether it’s a symphony or something simpler. 3. Check out Laura Dave’s other incredible novels, The First Husband, The Divorce Party, and London is the Best City in America. Discuss which is your favorite and why. 4. Laura Dave has created a special wine pairings–guide for book clubs: (http://sns-production-uploads.s3.amazonaws.com/assets_us/winepairingsforbookclubs.pdf). Use her guide to make your book club meetings extra special! I have to ask, did you have a particular celebrity in mind when you wrote Michelle? How did you research her character? Funny. No, Michelle is entirely her own. Michelle serves, in my mind, as kind of a glorified version of Georgia’s insecurity: a person that looms large in Georgia’s imagination and always manages to make her feel inadequate. That’s why I have Michelle show up at the moments that Georgia looks terrible. Symbolically, if not literally, Michelle is going to elicit that feeling for Georgia until she deals with herself. Separate from Georgia, I have great fondness for Michelle. She is searching for family, for connection. And even if she’s arguably doing it the wrong way, I like that we see her kindness with Maddie, her kindness with Ben. I like to think she holds on to her family despite herself. Speaking of research, you spent a lot of time in Sebastapol—home of the Last Straw Vineyard. Tell us what that experience was like. What surprised you about the winemaking process? Western Sonoma County is such a special place. I started exploring Sebastopol in particular shortly after moving to California, and the more time I spend there, the more it’s become a place I hold dear. There are a lot of changes in Sebastopol, and yet, it remains true to itself. To really understand that region though, you have to get down and dirty with the winemaking—and that has been the greatest treat of all. I was fortunate to spend time with some of the best winemakers in the world, and watching their devotion to their craft was so inspiring. To answer your question about the most surprising part of the winemaking process? The barreling and blending process was especially interesting. My husband equated it to watching a master chef make a stew. It was fascinating. Do you have a favorite wine? What is your go to? What do you drink on special occasions? I like prosecco a lot. Even if you’re a champagne drinker, I could share a few types of dry prosecco that would turn your head. And even the great ones won’t run you more than fourteen dollars. My true love though is a red wine. I’ve been indoctrinated. I love a Tuscan red. My passion though is for premium domestic wines from small vineyards that believe in low-yields and sustainable harvesting. I’m especially partial to a great California Pinot Noir. Lynmar Estate’s Quail Hill Pinot is among my favorites. It’s jammy and delicious. Their vineyard is my first stop in Sonoma County. Tell us about your writing process for this book. Did it differ at all from your three previous novels? Every novel is so different. For Eight Hundred Grapes, I was playing with an image for a long time of a woman showing up at her hometown bar on what should have been her wedding day. I didn’t know who she was talking to, and I didn’t know why she had come home, but that woman stayed with me. Somewhere along the line, I also started thinking about winemaking—how it was such an expression of faith and patience. How it required you to give it everything you had. Which seemed to me a metaphor for marriage and family and building a life that matters. Suddenly I knew where the woman in the wedding dress was going. And this novel was born. You have vast experience in the media industry, from magazine writing to radio to television. What has been the greatest challenge for you thus far? I don’t know about that, but it’s been interesting to learn how different mediums require different ways of thinking about story. I’m currently writing the screenplay for Eight Hundred Grapes (which is in development at Fox 2000), and even though it’s based on the novel, it has taken on a different life as we turn it into a movie. It’s challenging in a great way to tell the Fords’ story on the big screen. Which character surprised you the most as you developed the story? Who would you most like to return to? I don’t write an outline, so everyone is constantly surprising me! I figure if the characters are surprising me then my readers are going to get to have that same great experience. I have a real affinity for Jacob, who was full of surprises. I knew he felt things for Georgia, but I had no idea what he was going to do about those feelings: How would he reconcile his desire to be a good person with his new position at his company? He couldn’t possibly give Georgia back her vineyard, could he? Yet, could he walk away from this family he was starting to care about? At the moment when I realized what he was going to do, I found it very rewarding. As for the character that I’d most like to return to, I have to pick Ben. Do you have a big family? Which Ford sibling do you most relate to—Georgia, Finn, or Bobby? I have a small and very loving family. Though I’ve always dreamed of a big family—lots of people running around causing all kinds of trouble. So, with the Ford family, I relate to all of them and, at times, none of them. I adore the Ford family, but they all feel like wildcards. Especially as I moved deeper into the writing, the Fords were doing things I wouldn’t normally do, and I felt myself holding my breath that each of them would find their way through. My heart breaks for all of them, and I’m rooting for all of them. So I guess, surprisingly, I most see myself in Jen Ford, the mother character, who just wants her children to come through for one another and for themselves. What’s up next? Do you have another novel in the works? What can you tell us about it? It’s a lot of fun. The protagonist is unlike any protagonist I’ve ever written about before. She’s a pretty awful person—at least she appears to be upon meeting her. At the same time, she would be the first to say that about herself, which automatically makes you root for her, probably more than you should. Without spilling too many of the beans, I will say it’s a redemption story about the power of lying and the power of finding something like the truth. "Endearingly quirky...winningly explores the romantic choices we make." "You want meet-cute? Young women and wrong men? Burgeoning careers and best friends? Dave's your gal." “What truly sets Dave apart from her peers is her ability to convey the contradictions and imperfections, the inherent impossibility of true love, and yet somehow still make you believe in it."